Concord, NH – As the latest snow storm approaches New England, many state agencies are making preparations to continue to serve our citizens both during and after this weather event. There is a high probability of widespread wind damage involving downed trees and down wires. State Fire Marshal J. William Degnan reminds all citizens that every down wire should be considered live and should not be touched. As you clean-up the snow or any downed trees, we want people to think about their safety, and the safety of those around them. Downed trees and power lines also involve the loss of power causing people to seek alternative power sources. The use of portable generators has increased significantly in recent years. Generators create carbon monoxide. Unintentional carbon monoxide (CO) poisoning kills and injures people across the nation and New Hampshire each year. 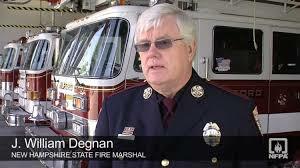 “Generators are a common source of unintentional carbon monoxide poisoning in New Hampshire”, warned State Fire Marshal Degnan. When using a generator, keep it at least ten feet from your home with the exhaust facing away from the house. Never run a generator inside of any building, including a garage with an open door. Carbon Monoxide is the silent killer. You cannot see, taste or smell carbon monoxide, but it can cause severe health problems or death. It is important that everyone have carbon monoxide detectors where they sleep. Also insure that the connection between your home and the main power line is disconnected. This will prevent any back-feed of electricity into the power lines that are compromised, endangering neighbors or the power company technicians working on the lines. Caution needs to be used in cutting and moving trees. Chainsaws are a powerful tool and need to be handled with care. Working around damaged trees can present a hazard that you may not easily recognize and you need to insure that you are not in a position that a tree may fall on you or others. For further information concerning safety, contact your local fire department or the State Fire Marshal’s Office. If you suspect a carbon monoxide or any other emergency, please call 9-1-1 immediately.